First day Stitch came into our lives. She was such a little nugget! As I am sure most of you know from my constant posting of her, Andrew and I have a dog named Stitch. We learned so much raising her and now that she is one (seven in dog years), I figure it would be the perfect time to share the tips and tricks that we used when training her as a puppy. Before I continue, I'd like to add that these trips and tricks work best when speaking in a neutral tone when giving commands, staying patient and providing your puppy with lots of praise! When your puppy does well, cheer them on like they've just won an Olympic gold metal. You can also use higher value treats (i.e. small pieces of chicken or turkey) and toys as rewards for good behavior. 1. Scheduling. If you're going to take anything from this blog post, please take this tip! I'd say this is the one that has made the biggest impact in Stitch's training. Not only does having a structured schedule ensure that you provide your new pup with everything that he or she needs, but it also helps them understand when it is time to eat, sleep, go potty and play. Figure out the best schedule for your new pup and stick to it. 2. Crate training. The primary purpose of crate training is to aid in the potty training process. However, it also aids in keeping your new pup from teething on your furniture. We decided to opt for this because after much research we learned that many dogs love having a crate because it helps them feel safe. It's the one place that is their own. This is only effective when you introduce it to your puppy correctly. The way the we introduced it to Stitch was by opening all the crate doors and leaving her to scope it out on her own. After she becomes uninterested in the crate, we introduced treats. Incentivizing your puppy to come in and out of the crate with lots of praise should do the trick! Make sure to take this slow and with time your puppy will be loving their crate. After we introduced Stitch to her crate. She still loves it! 3. Leash training. Although this still continues to be a bit of a struggle for Stitch, we have found that there is one major trick that has helped improve her walks. When guiding your pup on a leash, flick your wrist instead of pulling. To do this you'd simply keep your pup on a short leash, so that you have more control. You want your pup to be walking right next to you, rather than in front or behind you. Then when you want to move your pup in a direction, just give the leash a quick and light tug by flicking your wrist. You can do this serval times until your pup understands where you want them to go. 4. Socialize. By this I mean introducing your pup to various different dogs, places, people and situations. This is so important because it is what shapes your pup's personality. By socializing your pup as soon as possible, it should ensure that your pup becomes friendly and confident. Beyond 18 weeks it becomes a lot more difficult to socialize your dog and can lead to behavior problems later in life. 5. Key commands. There are a handful of key commands that you should start teaching your dog right away. All these key commands are important because they serve a practical purpose in ensuring the safety of your dog, yourself and the people around you. Here - In an excited voice call your puppy over by their name and "here". If they come, reward them. If you find your not coming when called, shorten the distance. Practice this throughout your home at random times to ensure your pup will listen to this command in any situation. Stay - Simply put your palm out in the stop position in front of your pup and say "stay". If they stay still, reward them. Continue to do this until you're confident that they will stay if you were to move. Do the same thing and take a step back. If they stay, reward them. Continue this moving further away each time your pup starts to get the hang of the distance you're working on with them. 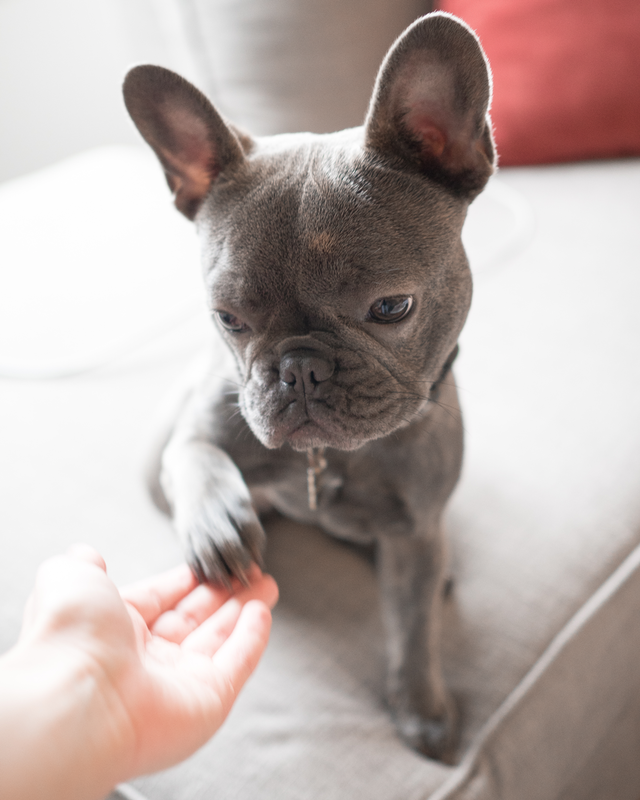 Leave it - Start by showing your pup that you have a treat or toy in your hand. Once you have gotten their attention, place the treat or toy under your hand on the ground. Your pup should naturally try to go after it. Wait for them to stop going after it and say "leave it". Then reward them with a treat or toy from your other hand. Keep doing this until you pup starts to get the idea, then try without having the reward under your hand. Look at me - This is great for getting your pups attention. Simply start by bringing a treat up to your nose and add "Look at me" to it. Your pup will follow the treat. Soon, it will become second nature to them to look up at you without a treat. Go to bed - Once your pup gets use to their crate try the same crate training technique that I mentioned under "crate training", but add "go to bed" to it. OK - This is a release command. This tells your pup when they have done well, when they are "OK" to go about what they were doing or when they are allowed to do something. To teach "OK", simply say "OK" after your dog has met a command. 7. Play time! You may not know it, but play time is essential to creating a bond between you and your pup. In addition to that, it's the perfect way to release some of your pup's energy. Some good play time activities include tug of war, fetch, and hide and seek. Those are about all the tips and tricks that I have. Congratulations and good luck training your new puppy! With patience, consistency and lots of love you and your puppy will be unstoppable! For more training tips and tricks, I highly recommend checking out Zak George's Dog Training Revolution on YouTube. To see more pictures and videos of Stitch, follow her on Instagram @SincerelyStitch!